April 18th 2015 was a momentous day for James and Shannon Young, their daughter Elizabeth and their 2 sons; Jesse and Michael. They had received the keys to their new beginning, and 1st Choice Home Solutions were grateful to be a part of it. 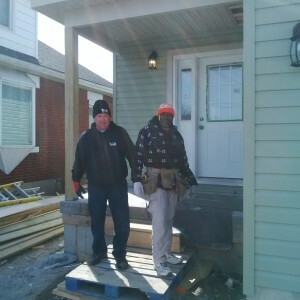 Our workers Abe and Pete installed all new siding, soffit and eavestrough to their home. “It’s a great organization. I can’t speak highly enough about it” James said during the official dedication ceremony and ribbon cutting. Habitat for Humanity® London was established in 1993 and worldwide Habitat has built 200,000+ homes. This was the 40th House Habitat for Humanity® London had built and was made up of forty teams from more than 380 people, mostly women volunteers were involved. The construction began in late 2014. Below are our workers; Pete (on the left) and Abe (on the right). 1st Choice Home Solutions are very proud to be working with Habitat for Humanity. We continue to help build families their Forever Homes. Every year 1st Choice helps build at least 2 homes. Keep checking back for our next Habitat for Humanity project!